Barge Transportation Market size is estimated to surpass USD 170 billion by 2024; according to a new research report by Global Market Insights, Inc. The increasing capacity of barges coupled with the improving quality of inland waterways are driving the barge transportation market share over the forecast timeframe. 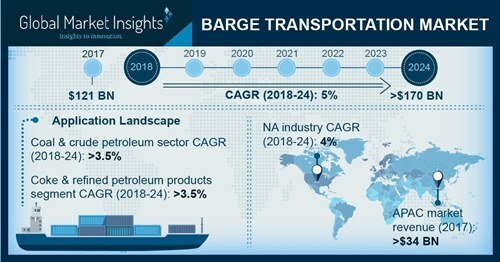 Rising demand for crude oil and petrochemical shipments across the globe supported by the increasing off-shore and shale oil exploration activities will further escalate the barge transportation market growth over the forecast timeframe. Industry participants are continuously involved in modernizing their existing barge transportation fleets and introduce innovative features including enhanced GPRS navigational facilities, solar powered barge monitoring systems, and vessel traffic management systems. These advanced features improve the navigational capabilities and the safety of the barges, significantly improving the efficiency for transporting goods across the globe. Dry cargo will account for the maximum barge transportation market revenue share of over USD 75 billion till 2024. The dominance can be attributed to the increasing demand for low value bulk industries for the transportation of recyclable and municipal wastes. The increasing requirement of safe barge transportation services for coal, lumber, steel, ore, and gravel will further propel the revenue generation over the forecast timeframe. Adoption of propulsion nozzles and restructuring of thruster tunnels reduces the barge transportation costs by 10% to 15%, thereby increasing the overall operating efficiency of the barges. The utilization of LNG for powering the barges improves the efficiency and significantly reduces the carbon emissions adhering to the stringent government regulations. The integration of GPS equipment provides real time monitoring and scheduling of barges enables the service providers to efficiently manage their shipments, positively influencing the barge transportation market share. The high costs associated with the acquiring and maintaining of the barges along with the stringent government regulations for improving the efficiency and reducing the carbon emissions from the ships may hamper the barge transportation industry growth over the study timeframe. Further replacement of barges with pipelines for liquid cargo by major OMCs may further restrict the barge transportation market revenue generation over the next six years. The coal and crude petroleum segment will showcase significant gains at over 3.5% from 2018 to 2024 owing to the increasing petroleum shipments globally. The introduction of innovative oil exploration techniques including directional drilling and hydraulic fracturing are further proliferating the segment revenue over the projected timeframe. Increasing oil exports from North America and the Middle East will foster the barge transportation market growth till 2024. Covered barge fleet will account for the maximum volume share of over 4 shipments-billion tons in 2017. This can be attributed to the benefits offered by these barges compared to the counterparts including safety for the goods, enhanced protection from uncertain weather conditions, and larger load carrying capacity. The requirement for affordable and safe barge transportation services for moving agricultural products will further drive the segment demand. Asia Pacific barge transportation market will account for the maximum volume share of over 5.5 shipments-billion tons by 2024. This can be credited to the availability of vast waterways channels across the region. The growing demand for petroleum products along with increasing waterways freight traffic will further propel the industry growth till 2024. The prominent players in the barge transportation marketplace include Kirby Corporation, American Commercial Barge Line (ACBL), Campbell Transportation, and SEACOR Holdings. Other notable players include PTC Logistics, Blessey Marine Services, Heartland Barge, and.Canal Barge. Industry participants are engaging in mergers and acquisitions for enhancing their market share. For instance, in 2016, Kirby Corporation announced the acquisition of the Inland tank barge fleet division of SEACOR Holdings Inc. for approximately USD 88 million. This acquisition was aimed at improving Kirby’s portfolio with 13 inland towboats, and 27 units of 30,000-barrel tank barges.